The Tokyo metropolitan region is the world's most populous urban area, with more than 30 million residents. But what you may not realize until you visit is that Tokyo, unlike London or New York, isn't a centralized city. Instead, it's a confederation of smaller (but still huge) districts and wards, with the most notable being Ginza, Harajuku, and Shinjuku. And while Akihabara isn't as well-known among newcomers as its aforementioned counterparts, it's still one of the most dynamic and enjoyable areas of Tokyo. From dining at animated cafés to racing Mario Karts in real life, "Electric Town" is full of pop culture pastimes. To say Akihabara is all about anime (Japanese hand-drawn and computer animation) and manga (Japanese graphic novels) is an understatement. Collectively known as otakus, young game-crazed hipsters line the streets of this section of the city. Stop into the Tokyo Anime Center to see its eye-opening exposition. Or visit manga shops like LAOX Asobit City and Mandarake, where you'll find everything from trinkets and gaming figurines to makeup. You may even run into the most conspicuous character of all, and the epitome of otaku culture—Pokémon. Manga characters are everywhere in Akihabara, so it's not difficult to imagine the waitresses in maid cafés coming straight out of Japanese comic books. In fact, these cafés are all about bringing comic books to life. And while some locales have a flirtatious element to the service, ones like Maidreamin and Pinaforte are family-friendly and suitable for both character-loving youngsters and game-obsessed adults. If you follow otaku-inspired social media profiles, you've certainly seen photos and videos of people driving the streets of Tokyo dressed as characters from the Mario Kart game. And while it's a city-wide activity, it's somehow more appropriate to take part in this behavior in Akihabara. Book your ride in advance with a company like MariCAR or seek out a same-day option once you arrive. But keep in mind that you'll need an international driving permit to engage in this festive activity. 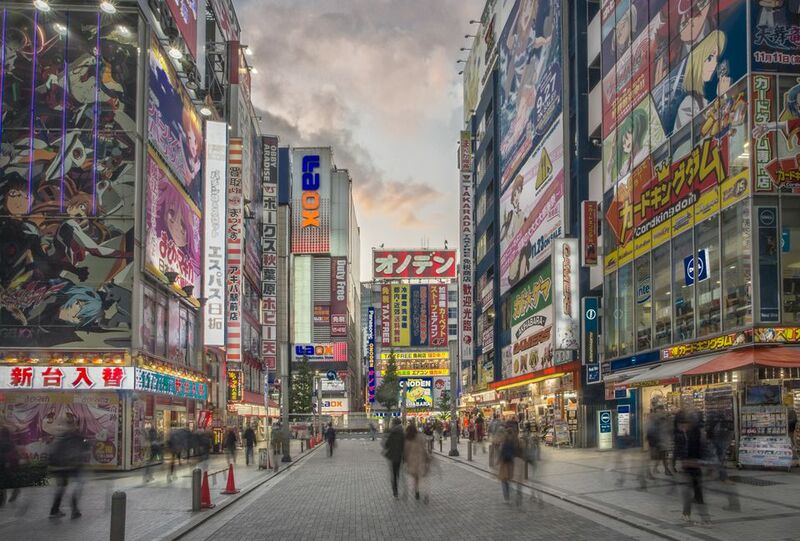 You needn't venture far in Akihabara to enjoy the full power of the Japanese gaming scene. After all, this is the historical ground-zero of arcade culture. Popular Akihabara venues include Hirose Entertainment Yard and several Sega arcades where you can enjoy your favorite vintage games. And while Sonic the Hedgehog and Ms. Pac-Man no longer entice the users of PlayStation and Xbox, they are right at home in Akihabara. Most Akihabara ventures involve futuristic or at least modernistic affairs. But you can also step back in time by visiting the Kanda Myojin Shrine (which dates back to the tenth century) to get a break from the bright lights and seemingly constant movement of the gaming vibe. This shrine pays homage to three gods: the god of marriage, (Onamuchinomikoto), the god of business prosperity (Sukunahikonanomikoto), and the god of expelling evil (Tairanomasakadonomikoto). Renew your vows before the god of marriage or take a stroll through the shrine's outdoor grounds to remind you that no matter how far in the future Japan may feel, you're never too far from the past. Step into a few shops in Akihabara to get the full gist of the region's nickname "Electric Town." Here, anything with an on-off switch can be purchased. Akihabara's most popular goods are, not surprisingly, computers and gaming gadgets, but you can also find appliances, cameras, and even toys. In some stores like Yamada Denki LABI Akiba, just flash your passport to enjoy a tax-free purchase. Or, browse through thousands of peripheral accessories at places like Yodobashi Camera Multimedia Akiba and Onoden. Cosplay (or "costume play") is popular among those in the performing arts trade. But it's also a fun hipster pastime, too, especially in Japan. Studio Crown sets the stage for you at their cosplay photography studio. Within a quick six-minute walk from Electric City, you can rent costumes and wigs for parading around the streets of Akibahara. Or, reserve your space in their studio to have the staff adorn you in dress and makeup, and then take a Polaroid to bring home as a souvenir. There's no better place to break out a high-tech app and go on a tour, as everyone in Electric Town is literally "plugged in." GPSmyCity offers wonderful tours of a thousand cites and is available for use on both IOS and Android devices. Their Akihabara tour takes you on a jaunt down the main drag, Chuo Dori, and then routes you onto side streets and alleys filled with electronics shops, anime exhibitions, and chain stores. Bonus—the app's GPS remains active even when disconnected from Wi-Fi or cell service. So, you don't have to purchase an expensive overseas data plan to use it. Gundam, a famous animated robot, is a Japanese youth culture obsession. And you can eat him too, at Gundam-themed cafes in Akihabara. Head to Gundam Cafe itself for pasta plates designed like robot heads, omelet and rice plates fashioned into helmets, and animated donuts with palm tree-shaped chocolates. Local coffee shops get in on the action, as well, with latte art that resembles robot heads.